Adopt a fruit tree and share the benefits of a fruit tree’s annual harvest with your family or friends - and leave the work to us. We will care for the tree during the year and you will pick the fruit during the fall harvest. We can even pick the harvest for you if you prefer! We usually expect to harvest two to three bushels (80-120 lbs) of apples from each of our trees each season. Actual yields will vary. Annual fruit tree harvests are reserved for orchard members only. The orchard may be enjoyed year-round: Spring blossom, Summer picnics, Fall picking. 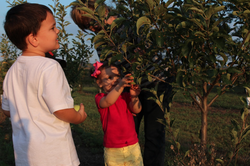 Come enjoy the apple harvest & Harrison County for a memorable outdoor adventure with your friends and family! When you adopt a fruit tree from us, you receive an annual membership and a personalized certificate, per tree, that is mailed to you to be redeemed for your fruit tree(s) harvest for the year. We also provide pick bags for your use when picking. Giving an annual apple tree harvest is a healthy and fun gift idea and a great way to bring family and friends together - ideal for holiday, birthday, or anniversary gift-giving.